Wildtype HEK293 and SGK3-­‐KO HEK293 cell lysates were immunoblotted for SGK3, Bleeds 5 - 10 of the S848D antibody, and the S037D 3rd Bleed. 10ug whole cell lysate was loaded onto a 10% SDS-­‐PAGE gel, and membranes probed with 1 ug/ml primary antibody, and 1:2500 secondary α-­‐Sheep antibody. Membranes were developed using ECL Chemiluminescent Reagent, and simultaneously exposed for 20 seconds onto light-­‐sensitive films. 3mg of HEK293 whole cell lysate underwent immunoprecipitation for SGK3 using 3ug of each Ab, coupled to 6ul Sepharose G beads. Protein was eluted from beads in 90ul 2X LDS with 5% BME, to give a 100ul sample. 10ul of this sample was loaded onto a 10% SDS-­‐PAGE gel, with 20ug whole cell lysate and IP supernatant. 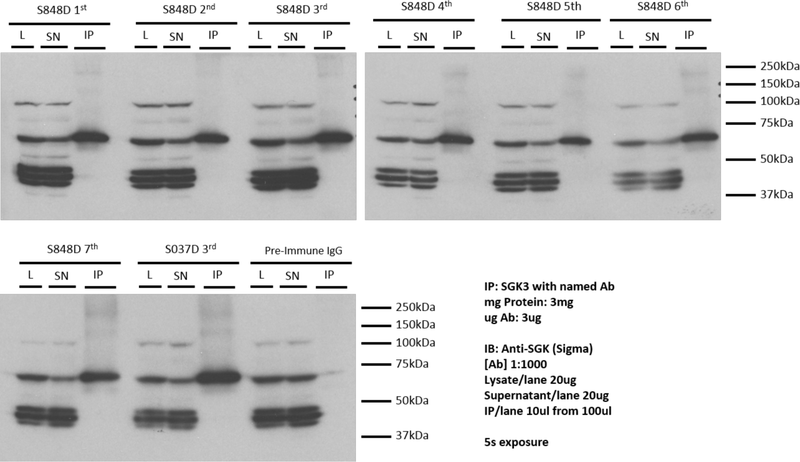 Immunoblotting was performed using Anti-­‐SGK Ab from Sigma (Cat# S5188). The data suggest that all the antibodies IP SGK3 from whole cell lysate very well. 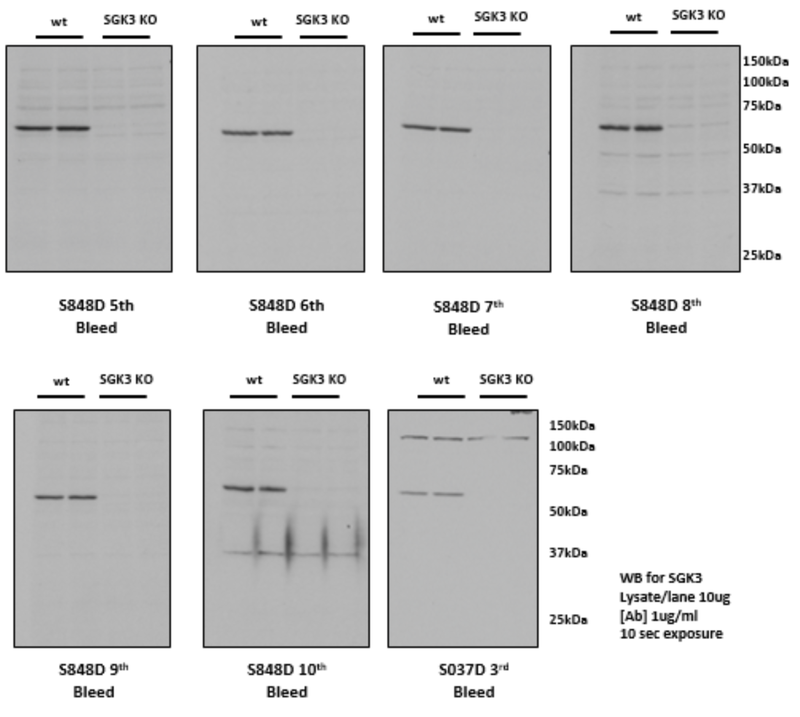 The later bleeds 5-­‐7 also show more substantial depletion from the supernatant.